So I'm here for the 2nd day of the NJEA teachers convention here in Atlantic City, and they're not letting us up on the 3rd and 4th floors yet, so I'm sneaking around the staircase with some other rebel teachers instead of waiting in the super-long line for the escalator. I went to one class yesterday about gangs, and it was somewhat informational. I knew most of the stuff from my 2 years teaching @ Pearce. There was this super annoying guy that loudy and angerly attributed the rise in gang presence to removing prayer from schools. It's not the decline of a solid family presence, parents having to work long hours to be able to support their families, or the result of our American popular culture. It's only because they took prayer out of schools. That's like saying because someone dropped a pencil nearby, I tripped over my shoelace - if they didn't drop that pencil, then I wouldn't have tripped. There's no solid link that proves forcing kids to pray (or alienating those that choose not to) that helps keep the lure of gangs at bay. Anyways, I'll get off my soapbox. Also, yesterday I was really looking forward to a class over podcasting. If you don't know what it is, don't worry about it. 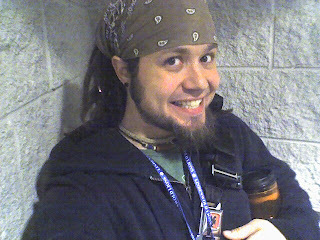 But they canceled it, so I spent time out "on the floor" of the convention. There was more free crap there than I've ever seen. I've got plenty of pens and post-it's so I didn't get much. Well, here's an update on the day since I didn't get to finish this post before. The first workshop was great. It's a good thing I snuck up the staircase, it filled up fast. It was a workshop with practical, fun stuff to do in the mathematics classroom. After that was over, I went down to where my second workshop would be. The one I was really interested in was just next door and the third class I had planned for the day - creating an online learning community - about blogs and podcasts. Well, since the first class filled up so quickly, I was nervous about getting out of my 2nd class too late to be able to make it to the online community one, so I decided not to go to the second one. I went back downstairs to the convention floor in search for more free stuff and to eat. Afterwards, I went up to the room the online community workshop would be a little over an hour and a half early. I finished my beanie (which didn't turn out that great and looks like it's way too big). The class, though, was a bust. I was really disappointed. It didn't say who it was geared towards, but it was clearly geared towards the tech unsavvy. There were a couple of things the presenter said that I clearly knew were incorrect. It was really one person who just kinda figured things out on their own, but not completely understanding it all, teaching those that knew very little about technology in general. I was thinking afterwards, & I could have gotten just as much out of that class as I would have spending 5 minutes reading through a summary and taking down some websites. So now, I'm exhausted and sitting on the hour long train ride home. I think I might take a nap. I just hope I wake up before my stop. Joce and I are just going to take it easy tonight and have some "us time." I'm looking forward to that.